IAHTM established the prestigious Lifetime Achievement Award in 2015 to honor those outstanding individuals in the textile industry who have shown leadership and dedication to the profession. This award will be given out at the IAHTM Annual Conference that is in the fall of every year. Nomination Forms will be accepted throughout the year. All nominations need to be submitted to the Executive Director by August 1st of each year. The Executive Director will submit all nominations to the current President of IAHTM to review and select the recipient(s) at the next Board of Directors Meeting. 1. The nominee must have been actively involved as an educator, operator or vendor in the Laundry and Linen service industry for at least 15 years. 2. The nominee must have been involved and supportive of IAHTM, its members, the ALM or other Associations in the industry for at least 10 years. 3. It is recognized that the individual has positively impacted the industry in some way including having made a contribution to its betterment. 4. The individual may have supported others including staff members or colleagues in the growth and improvement of roles in the industry. 5. The nominee must have provided outstanding service to the textile industry, community and organization with which they work. 6. The nominee must display a commitment to high ethical standards and integrity. • Nominees may include letters of recommendation describing the nominee’s character and contributions to the Textile Industry. • Recipient is required to submit a biography and digital headshot once selected. Powell, OH. – Oct. 23, 2018 – The International Association for Healthcare Textile Management (IAHTM) has named Steve Ripley a “2018 Lifetime Achievement’ recipient. 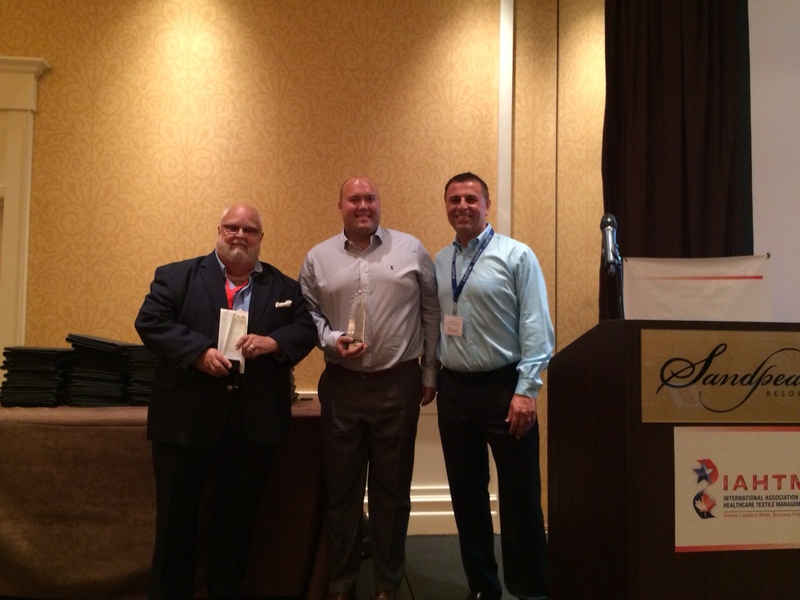 The honor was presented at IAHTM’s annual meeting held recently in Naples, FL. 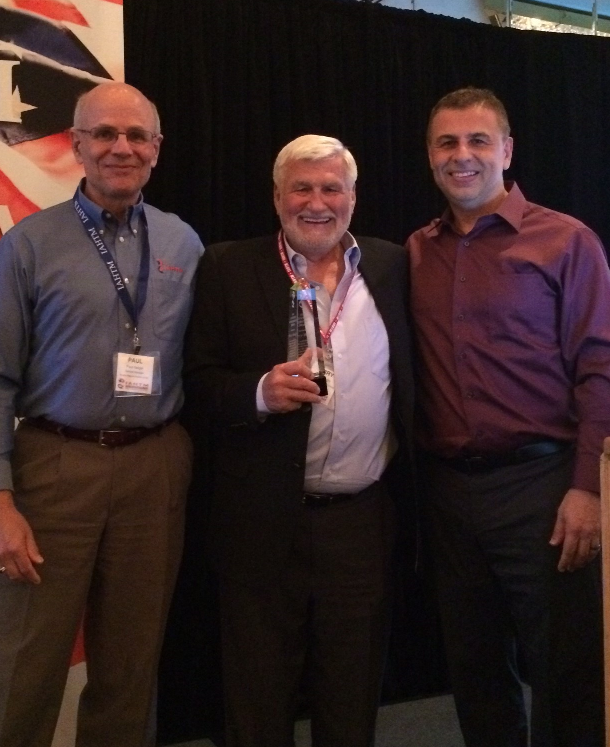 Also honored at the event was Alan Schwartz, recently retired president of Superior Uniform Group, Seminole, FL. Steve Ripley (center), past president of Space Coast Hospital Services Inc., Rockledge, FL, receives the “2018 Lifetime Achievement” award from The International Association for Healthcare Textile Management (IAHTM). The honor was presented by IAHTM President Myles Noel (left) and IAHTM 1st VP Mark Hoenemeyer (right). Powell, OH. – Oct. 19, 2018 – The International Association for Healthcare Textile Management (IAHTM) has named Alan Schwartz a “2018 Lifetime Achievement’ recipient. 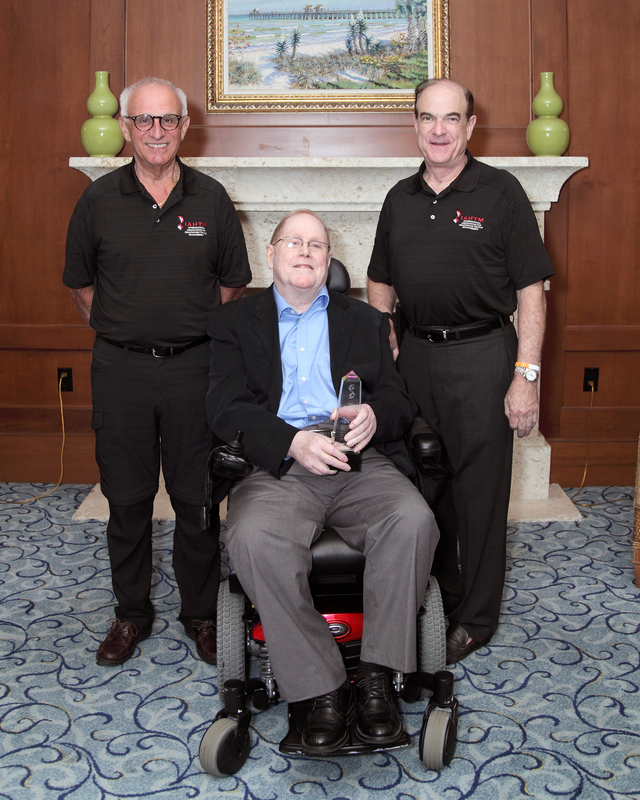 The honor was presented at IAHTM’s annual meeting held recently in Naples, FL. Schwartz (photo right, caption below) is the recently retired president of Superior Uniform Group, Seminole, FL, where he remains as a consultant and a member of its board of directors. He was nominated for the award by Nicole Grubich, IAHTM 2nd VP; she is executive director, West Michigan Shared Hospital Laundry, Grand Rapids, MI. Alan Schwartz (third from left) receives the "2018 Lifetime Achievement" award from the International Association for Healthcare Textile Management (IAHTM). Pictured with Schwartz are (left to right) Scott Delin, VP Sales, Fashion Seal Healthcare; Mark Hoenemeyer, 1st VP, IAHTM, and CEO, BayCare Services; Schwartz; Myles Noel, IAHTM president, and CEO, COMTEX; Nicole Grubich, 2nd VP, IAHTM, and executive director, West Michigan Shared Hospital Laundry; and Dan Schwartz, director of operations Fashion Seal Healthcare. 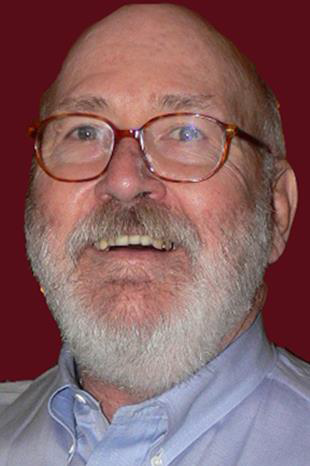 Powell, OH – Nov. 16, 2016 – The International Association for Healthcare Textile Management (IAHTM) has named Gerry Daigle (in photo) its “2016 Lifetime Achievement” recipient. The honor was presented at IAHTM’s Annual Meeting and Education Conference held Oct. 15-18 in Vancouver, British Columbia. Daigle maintains an executive role within MIP Inc., a global manufacturer and distributor of reusable of healthcare textiles and related products based in Montreal, QC, Canada. IAHTM is a nonprofit membership organization for healthcare laundry cooperatives that provides senior-level textile managers with resources and support to maximize their laundries’ efficiencies and control costs without compromising quality or patient focus. Each year, IAHTM recognizes an individual with its Lifetime Achievement award for his or her career-long contributions to and accomplishments in the textile industry. Daigle was nominated for the award by IAHTM board members. In his nomination, they noted Daigle’s active role in: communicating and educating healthcare laundries on the use of reusable incontinent products as an alternative to disposables; helping to introduce to the industry the benefits of knitted hospital linens vs. woven bed linens; supporting through education sponsorship industry organizations like IAHTM, Association for Linen Management (ALM) and American Reusable Textile Association (ARTA); and continually participating and volunteering in proactive efforts to promote the educational aspects and growth of the industry.